Let the Rack Shack BBQ shake up your next meeting or corporate event! Annual picnics, employee appreciations, daily meetings… The smoky tempting aromas of Rack Shack BBQ will increase your attendance and participation every time! Teambuilding is choosing Rack Shack BBQ. It is, after all, America’s Food and it’s the Right Thing To Do! Do you find it challenging to find that hook to make your colleagues excited to come to the next meeting or company event? Just tell them the Rack Shack BBQ is coming and they’ll beg to be invited! 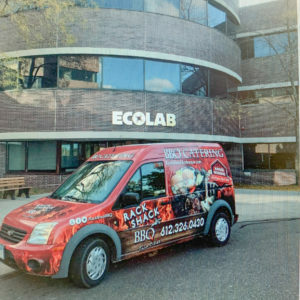 We have been providing our world-class barbeque to some of the top businesses in Minnesota since 2010. We serve small groups of a couple dozen to large gatherings of a couple thousand with rave reviews! Give the People What They (and you) Want! In addition to our world-class smoked & barbequed meats and sauces, we have a wide variety of side dishes, appetizers and salads. We will customize any menu to fit your meal vision and your guests’ needs! Choose from one of our per person priced all-inclusive lunches, or create your own menu! Although we at the Rack Shack BBQ are carnivores by nature, we are sensitive to every individual’s dietary needs and restrictions. Our meats, sauces and signature spice rub are all gluten-free, as well as several of our side dishes. Since we can't let the herbivores go hungry, there are also plenty of options for our vegetarian and vegan team members. We offer a wide variety of plant-based protein options so everyone can go back to work with full bellies and BBQ smiles on their faces! Barbeque is meant to be served buffet style. Rack Shack BBQ is all about bringing people together and letting them load their plates just the way they like. As we know, you have a million little things to take care of in the day to day.... you can mark one thing off your list - you ordered from Rack Shack BBQ! Rack Shack BBQ will provide any level of service you may need. Arrange a pickup order with us from the store or we can deliver and set it up right to any location. We can provide everything you need you in order to make your workday easier! For large scale events, we can set up, stay on site to serve, and clean everything up for you! Check out our Services page to see what style fits your event the best. The Rack Shack BBQ can cater to any private or public residence or venue as we are licensed by the State of Minnesota. If you can't find the perfect meeting space in your own buildings, we partner with and are referred by many venues across the state. If you choose a venue that does not currently list us, don't be afraid to ask! Check out our Venues page for some of our favorite parks, local tap houses and more!